This map shows areas of seismic risk from high (red) to low (grayish-green) and is from a 2007 report on the seismic design categories in Washington. Clicking on the map will download the publication. Earthquakes occur nearly every day in Washington. Most are too small to be felt or cause damage. Large earthquakes are less common but can cause significant damage to the things we count on in everyday life, such as buildings, roads, bridges, dams, and utilities. Washington has the second highest risk in the U.S. of these large and damaging earthquakes because of its geologic setting. Read more below to learn about how and where earthquakes occur, what to do before, during, and after an earthquake, and what scientists are doing to learn more about them. The mission of the Washington Geological Survey is to collect, develop, use, distribute, and preserve geologic information to promote the safety, health, and welfare of the citizens, protect the environment, and support the economy of Washington. The Earthquake Hazards Scenario Catalog contains loss estimates for a suite of earthquake scenarios. These scenarios were selected to represent reasonable estimates of the most serious earthquake hazards everywhere in Washington as a basis for planning. Liquefaction susceptibility maps outline areas where water-saturated sandy soil loses strength during earthquake shaking. NEHRP (National Earthquake Hazards Reduction Program) site class maps outline areas where soils amplify ground shaking. Seismic Design Category Maps for Residential Construction were developed and published in 2007. Active fault maps compile all of the most recent geologic mapping in one state-wide map. The maps are used by state and local governments to develop and update hazard-mitigation and response plans, and to mark geologically hazardous areas. Please visit our Geologic Information Portal and Geologic Hazard Maps page for the most up-to-date listing of all of our hazard maps. The Survey conducts and publishes geologic mapping to identify and characterize faults throughout the state. The publication Faults and Earthquakes in Washington State is a state-wide compilation of active faults and folds. Each year we map additional areas and learn more about existing faults and (or) discover new ones. The Survey works to increase public and scientific understanding of fault and earthquake hazards in our state. We work closely with the Washington Emergency Management Division, the Washington Seismic Safety Committee, and the Federal Emergency Management Agency to ensure that the best-available science is used in the development of hazard mitigation plans. In addition, the Survey performs seismic safety evaluations of schools. Consider subscribing to our blog, Washington State Geology News, to receive notifications when new information is published. Also check out Ear to the Ground, published by the Department of Natural Resources. The Survey is working with the Office of the Superintendent of Public Instruction (OSPI) and Reid Middleton, an engineering firm, to perform seismic safety assessments of 220 school buildings across the state. Visit our School Seismic Safety page for more information. Large earthquakes are likely to happen in Washington during your lifetime. Most of the populated areas of the state have a 40–80% chance of having an earthquake in the next 50 years. The most important thing you can do before the next earthquake is to prepare. An earthquake can be a scary event. The more you know what to expect, the better prepared you will be to help yourself, your family, and others around you. Know what to expect. Electricity, water, natural gas, and phones may not work. This means that the internet, your cell phone, grocery stores, and gas stations may also not work. Prepare to be on your own for at least three days. Make an emergency response plan for you and your family. Identify and secure items in your home or work that could cause damage. This might include flammable appliances like a water heater, tall items like book cases, or heavy pictures. Know what other hazards you might face. Earthquakes can trigger landslides and tsunamis which can happen after the main event. Both of these things can cause equal or greater damage than the actual earthquake. Participate in the yearly Great ShakeOut earthquake drills. These drills occur on the 3rd Thursday of every October. They are a great way to practice what to do when an earthquake happens. When an earthquake happens there will not be time to google what you are supposed to do. Drop to your hands and knees. Cover your head and neck with your arms to protect against falling debris. Hold on to any sturdy shelter until the shaking stops. Stay away from glass, windows, outside doors and walls, and anything that could fall down. If you are in bed: STAY there and COVER your head and neck with a pillow. DO NOT get in a doorway. Doorways do not provide protection from falling or flying objects and you may not be able to remain standing. Stay inside until the shaking stops and it is safe to go outside. Do not exit a building during the shaking. Most injuries occur when people inside change rooms or try to leave the building. Move away from buildings, streetlights, and utility wires if you can. Once in the open, Drop, Cover, and Hold On. STAY THERE until the shaking stops. Stop as quickly as safety permits and stay in the vehicle. Avoid stopping near or under buildings, trees, overpasses, or utility wires. Proceed cautiously once the earthquake has stopped. Roads, bridges, or ramps may have been damaged by the earthquake. Once the shaking has stopped, exit the building if it is safe to do so. Expect aftershocks. After a large earthquake it is common to have other large earthquakes for hours, days, and even weeks. Drop, Cover, and Hold On whenever you feel shaking. Expect and help to extinguish fires. Small fires are the most common hazard after an earthquake. Never use a lighter or match near damaged areas. Evacuate to higher ground if you are near a large body of water. Tsunamis are a common result of large earthquakes in Washington. The Safe America Foundation suggests texting as a way of communication. If everyone tries to use their cell phones, it can overload the system. What is an 'active' fault? The term ‘active’ can have different meanings. At the Washington Geological Survey, ‘active’ means that a fault has evidence for movement within the Holocene time period (since about 12,000 years ago). It usually also means that there are earthquakes (even small ones) on the fault. This diagram shows the many types of active faults and the general location of past earthquakes in Washington. Washington has dozens of active faults and fault zones. Some of these faults are in remote areas. Others, like the Seattle fault and southern Whidbey Island fault zone, cross under major cities and pose a significant hazard. In general, larger faults make larger earthquakes. All faults, regardless of size, can be dangerous if they rupture. The Geologic Information Portal has a Natural Hazards theme that shows active faults and earthquakes. Click the "Seismogenic Features" button in the Map Contents window to display faults and earthquakes. The largest active fault that will affect Washington (and the whole Pacific Northwest) is the Cascadia subduction zone. This fault produces some of the largest and most damaging earthquakes in the world (M9). A damaging earthquake is inevitable on this fault, but we do not know exactly when it will happen. Have all the active faults been mapped? Geologists are constantly trying to better understand the faults in our state. A 2014 map shows what we know about the age of faults in Washington. Many faults have not been studied enough to know if they are active. Other faults are inactive and are left over from much older periods of deformation. These older faults do not have any evidence for recent activity, but the Earth is always changing. Large and damaging earthquakes are inevitable in Washington, but no one knows exactly when they will happen. Most of the populated areas of the state have a 40–80% chance of having an earthquake in the next 50 years. The best thing you can do is to become prepared. You will not be able to google “what to do in an earthquake” when it is happening. After the earthquake, many things you count on may not be available. For example, it is unlikely that you will be able to use electricity, cell phones, or the internet. It may not be possible to find water, fuel, or food until services are restored days or even weeks after the event. The Cascadia subduction zone last ruptured over 300 years ago on January 26, 1700. The average time between large earthquakes is about 535 years, but has been as little as 200 years, and more than 1,000 years. The Seattle fault last ruptured about 1,100 years ago in AD 900–950. Geologists do not yet know how often earthquakes happen on this fault. We do know that it is active and will likely produce a large M6–7.5 earthquake when it next ruptures. There are many other active faults in Washington and any of these could produce a large earthquake in the future. There are also many faults that have not been studied enough to know if they are active. Finding and mapping these faults is an important mission of the Washington Geological Survey. Many universities and other organizations (such as Cascadia Region Earthquake Working Group and the Pacific Northwest Seismic Network) also work to understand active faults in Washington. Finding and learning about faults requires many different aspects of geology and geophysics. Finding faults and knowing how often they rupture is one of the most important tasks to keep society safe from these hazards. Geologists at the Survey spend time mapping the geology of the state, looking for faults, folds, landslides, and different rock types. In places where there is little vegetation, different rock types and faults can be found with relative ease. In much of Washington, dense vegetation covers the land and makes finding faults very difficult. One of the most important new technologies for finding faults (and landslides too) is called lidar. Lidar maps show the Earth’s surface without vegetation. These maps are created by small planes that use a specific type of laser to measure the elevation of the ground. This new method allows geologists to see through trees and vegetation to find new faults. Use your mouse to hover over the photo to compare geologic maps with and without lidar. Lidar enhances the terrain readability—the steepness of the river channel and the identity of other geologic features instantly become obvious. Once a fault is located, it is important to know if it is active. Most faults are considered active if they have evidence for movement (this includes earthquakes) within the past 12,000 years (the Holocene time period). This evidence can come from finding something younger than 12,000 years that has been deformed or moved by the fault. People who look for evidence of past movement on faults are usually called paleoseismologists (from paleo-ancient and seismologist-one who studies earthquakes). A paleoseismologist will look for surface ruptures along faults and may use carbon-14 dating to learn when the rupture happened. Sometimes there may be a layer of volcanic ash or charcoal that has been deformed by the fault. By finding the age of the deformed layer, a paleoseismologist can determine the minimum age of the fault. Large earthquakes, like those from the Cascadia subduction zone on January 26, 1700, often create tsunamis. The tsunamis can travel far inland and deposit layers of sand and organic material. Paleoseismologists have found places that record many of these tsunami deposits. The age of the earthquake is learned by dating the organic material in these tsunami deposits. There must be tsunami deposits of the same age along much of the Oregon and Washington coast in order to qualify as an earthquake. Scientists have also dated large underwater landslides and turbidites that travel from the continental edge far out into the ocean basin. These large underwater slides only occur during very large earthquakes and are one way to learn about earthquakes that happened thousands of years ago. Although we know much about active faults and earthquakes, there is much more to learn. In fact, new faults are found every year during our geologic mapping efforts. Even when the location of a fault is known, there is much additional work to determine how hazardous it may be. Scientists at the Washington Geological Survey, the U.S. Geological Survey, universities, and many private geologic consulting firms work diligently to understand how often earthquakes happen on various faults throughout Washington. WHAT ARE FAULTS AND EARTHQUAKES? Faults are features in the Earth’s crust where rock periodically breaks and moves, releasing seismic energy and creating an earthquake. Faults can be grouped based on their relative movement into three types. Each type has different kinds of earthquakes. Most faults in Washington are a mix of a strike-slip fault and a thrust or reverse fault. These combination faults are called oblique faults and include the Seattle fault, southern Whidbey Island fault zone, and Darrington–Devils Mountain fault zone. A strike-slip fault occurs when two blocks move past each other. The Straight Creek fault in the Cascade Range is an example of this kind of fault and has ~50–60 miles of movement across it. The San Andreas fault in California is a good example of a very active strike-slip fault. A reverse fault occurs when two blocks are pushed together and one moves up and over the other. Reverse faults are usually steep and occur in regions of compression. The Seattle fault is a good example of a fault that is mostly reverse. This means that when the Seattle fault ruptures the south side of the fault moves up relative to the north side. A thrust fault is a special kind of reverse fault that has a shallow dip. The Cascadia subduction zone along the Washington and Oregon coast is one of the biggest hazards to our state and is a good examples of this kind of fault. Hover your mouse over the graphic to see how spreading at mid-ocean ridges causes large thrust faults at the edge of the Pacific Northwest coast. Graphic from IRIS. A normal fault occurs when two blocks are pulled away from each other. Washington has few large normal faults because it is mostly in a region of compression. Small normal faults are found along the top of folds in eastern Washington in the Saddle Mountain graben. The Eastern Sierra fault along the east side of the Sierra Nevada mountains in California is a good example of an active normal fault. Faults can also be grouped based on what part of the crust they occur in. This kind of grouping gives us information about how common earthquakes might be and how large an area may be affected. Throughout the world ‘shallow’ earthquakes generally refer to earthquakes that are less than ~45 miles deep. Earthquakes between 45 and 185 miles deep are called ‘intermediate’, and earthquakes over 185 miles deep are called ‘deep’. Geologists have used the location of these shallow, intermediate, and deep earthquakes to learn about subduction zones throughout the world. In the Pacific Northwest we use the term ‘shallow’ to talk about faults and earthquakes less than 18 miles deep. These faults and earthquakes occur in the continental crust of North America. We use the term ‘deep’ to talk about faults and earthquakes deeper than about 18 miles. These faults and earthquakes occur in oceanic crust as it is subducted beneath the continent. Shallow faults produce earthquakes in the upper 18 miles (30 kilometers) of the Earth’s crust. These types of faults are common, but usually small. Larger crustal faults, such as the Seattle fault and southern Whidbey Island fault zone, can produce earthquakes up to magnitude 7.5. Earthquakes on shallow faults typically last 20 to 60 seconds and the shaking is localized to the general area of the fault. Earthquakes on faults like these may cause tsunamis in the Puget Sound region. Deep faults can occur where two tectonic plates collide and one of the plates is forced beneath the other. The plate that is forced down can have faults within it that still rupture and produce earthquakes. These faults and earthquakes usually occur at great depth (tens to hundreds of miles). Because they rupture at such great depth, their seismic energy is distributed over a large area. This means that a large area feels the shaking, but the intensity is less than a similar shallow earthquake. The shaking usually lasts less than a minute and doesn’t generally cause a tsunami or have many aftershocks. Hover over a cluster of earthquakes to learn about the different types in the Pacific Northwest. Graphic from IRIS. A special type of shallow fault, called a subduction zone or ‘megathrust’, occurs where an oceanic plate moves beneath a continental plate. The boundary between the two plates covers a large area and can lock together. Like other faults, when enough stress builds up, the ‘megathrust’ will rupture. What makes these faults ‘mega’ is that the amount of energy released is hundreds to thousands of times more than almost any other type of fault. The ground shaking from these earthquakes can last for several minutes. The 2011 Tohoku earthquake in Japan occurred on this type of fault and released enough energy to slightly change the Earth’s axis of rotation. Additionally, because the continent moves up and over the ocean plate, large amounts of sea water are displaced and cause damaging tsunamis. The Cascadia subduction zone just off the Washington coast is this kind of fault and is one of the largest geologic hazards to our state. An earthquake occurs when rock inside the Earth moves or breaks. This movement happens because stress builds up as tectonic plates move. The process of breaking and moving rock releases a large amount of energy that travels through the Earth as seismic waves. Some types of seismic energy (P waves) are similar to sound energy that is released if you break a twig or slide a chair across the floor. In this sense, the shaking of the ground is the ‘sound’ of rocks breaking and moving deep within the Earth. Other types of seismic energy (S waves) also travel through the earth, but they move with a side-to-side (shearing) motion. Seismic waves travel at hundreds to thousands of miles per hour and quickly reach the surface where they are felt or measured. Sensitive seismographs located throughout the state, and all over the world, measure this seismic energy. Even if the earthquake is too small to be felt by people, seismographs can detect it. The study of seismic waves is called seismology and has allowed scientists to learn much about the internal structure of the Earth. Nearly all earthquakes occur on faults, features in the Earth where rocks move past each other. Faults often occur at and near the boundary of large tectonic plates because the plates are moving in different directions. Faults can also occur within a tectonic plate when the plate itself is deforming. Some faults reach the surface and can be found by geologists. Other faults may lie entirely underground, or could be covered by vegetation and (or) sediment. Both types of faults can cause ground shaking during an earthquake and may cause permanent deformation of the ground. The continued movement along faults over millions of years can build mountains, tear a continent apart, and move tectonic plates thousands of miles. Earthquakes can be measured in many ways, but the most accepted method is called ‘moment magnitude’. The Moment Magnitude Scale (M) measures the total amount of seismic energy (known as ‘moment’ to engineers and seismologists) released by an earthquake. The moment magnitude scale is a type of logarithmic scale, where each increase of 1 means ~32 times more energy is released. An increase of 2 means that ~1,000 times more energy is released. For example, a M7 earthquake releases 32 times more energy than a M6 earthquake, and 1,000 times more than a M5 earthquake. Notable earthquakes in bold happened in Washington. The Cascadia subduction zone off the Washington and Oregon coast is capable of some of the largest earthquakes in the world. This fault will have an earthquake in the future, but we cannot predict exactly when. The moment magnitude scale replaced the Richter scale in the late 1970’s. The Richter scale was developed in southern California in 1935 and was based on the local ground motion. This was a problem because no two locations would agree on the size of the same earthquake. Also, very large earthquakes were difficult to measure accurately. These and other problems led to the search for a scale that was based on the physical processes that happen during an earthquake. The Mercalli Intensity scale is another historical way to measure the intensity of an earthquake. It is a qualitative scale that ranges from I–XI (1-11) and measures the amount of damage caused by an event. For earthquakes that occurred before seismographs were invented, the Mercalli Intensity scale was used to make maps of damage and determine the size and location of an earthquake. How often do earthquakes happen? Scientists have been trying to understand how often earthquakes happen for over 100 years. It is not yet possible to predict when a fault will have an earthquake. However, we can learn which faults are active and which are inactive. For some active faults, such as the Seattle fault or Cascadia subduction zone, we can also learn how often large earthquakes have happened in the past. This map shows different seismic design categories that correlate with amount of seismic risk. Higher risk areas are in orange and lower risk areas are in green. This map is from a 2007 report on the seismic design categories in Washington. Clicking on the map will download the publication. Knowing how often large earthquakes have happened in the past helps us to know how often they might occur in the future. For example, the Cascadia subduction zone has had between 15 to 19 earthquakes over the past 10,000 years. This averages to ~660 to 525 years between events, but there is a lot of variation. Some events appear to be only 200 years apart, and others are more than 1,000. The last major earthquake was over 300 years ago. The next earthquake is inevitable, but the variability makes it difficult to know exactly when. Although we cannot predict exactly when the next earthquake will happen, we can predict the general distribution of earthquake sizes. Charles Richter and Beno Gutenberg discovered that for every magnitude of earthquake, there are about ten times more earthquakes of the next lower magnitude. For example, if there is one M7 earthquakes in an area every 1,000 years, then there will be about 10 M6 earthquakes, 100 M5 earthquakes, and 1,000 M4 earthquakes during the same 1,000 years. Since their initial discovery, research has shown that the actual number of earthquakes is somewhere between 5 and 10 for each change in magnitude. These differences are related to the overall pattern of stress in the crust, what types of rocks the crust is made from, and how many faults there are. For each increase in earthquake magnitude, there are about 10 times fewer earthquakes. After large earthquakes there are usually many aftershock earthquakes. Aftershocks can be nearly as large as the main earthquake and can cause significant additional damage. These aftershocks can last for hours to weeks or months. If a large earthquake happens, be prepared for many more earthquakes. This video from the 2011 Tohoku subduction zone earthquake shows the earthquakes before, during, and after the main M8.7 event on March 11 (at 1:50 in the video). Each of the earthquakes listed on the bottom of the screen is capable of significant damage. In the month after the main earthquake there were about 60 M7 and M6 earthquakes. Each of these aftershocks would be a significant earthquake if it happened on its own. Earthquakes cause damage by moving and shaking the ground, sometimes for several minutes. The shaking can damage or destroy buildings and other infrastructure. Most damage and loss of life in earthquakes is a result of ground shaking. The shaking can also cause landslides, surface ruptures, ground cracks, liquefaction, tsunamis, and seiches (standing waves). The combination of all of these effects is what makes earthquakes such a powerful geologic hazard. Do you know what to do if there is an earthquake? In this photo, visitors to Green Lake Park near Seattle, Washington, have parked their bicycles as they look at the cracks made by the April 1949 earthquake. Much of the land along the southwestern part of the lake cracked and subsided. Photo courtesy of MOHAI (neg. PI22343). When earthquakes occur on faults that reach the Earth’s surface, the ground may rupture. Depending on the type of fault, the ground can move laterally, vertically, or a combination of both. The April 1949 Tacoma earthquake measured 7.1 on the Richter Scale and caused damage from southern Oregon to British Columbia. In Seattle, the quake damaged buildings, weakened bridges, started fires and opened cracks in the earth. One of these cracks appeared along the pathway around Green Lake. Sometimes Geologists can use the offset land surface to understand how much the fault moved during the earthquake. This photo shows a fence that was offset about 8.5 feet during the 1906 Great San Francisco Earthquake on the San Andreas fault. This is a very good example of a strike-slip fault. Photo by G.K. Gilbert, from the Steinbrugge Collection of the UC Berkeley Earthquake Engineering Research Center. Even when an earthquake happens on a fault that doesn’t reach the surface, the ground can still show signs of cracking. Often this cracking happens because a soft part of the ground liquefies during the shaking. This is called liquefaction and is discussed in the next section. The strength of ground shaking (called ‘strong motion’ by seismologists) usually decreases with distance from the earthquake source. This is similar to how sound is quieter when you move away from a speaker. Unlike sound, ground shaking can be amplified or attenuated (made less) depending on the type of material at the Earth’s surface. For example, a building on soft soil will experience more shaking than the same building on bedrock. Ground shaking is a hazard near the epicenter of an earthquake and also in areas far from the earthquake where amplification occurs. As an example, parts of Seattle and certain areas of downtown Olympia are built on softer ground that will amplify ground shaking during an earthquake. Geologists and geophysicists at the Washington Geological Survey map out these areas of amplification to help reduce damage during an earthquake. This car was parked on sand during the 2011 earthquake in Christchurch, New Zealand. During the shaking liquefaction occurred, the sand lost its strength, and the car sunk. After the shaking stopped the sand regained its strength. Photo from Pacific Northwest Seismic Network Seismo Blog. Liquefaction is when wet soil or sediment loses strength because it is being shaken during an earthquake. The material becomes so weak that it behaves more like a liquid than a solid. Liquefaction has caused significant damage during earthquakes in Washington. View of the Sunset Lake liquefaction failure about three weeks after the earthquake. Fir trees near the failure are tilted and indicate rotation into the lake (to the left of the photo). A drill rig left of the blockade is collecting data about the failure. Photo by Steve Palmer. Many low-lying areas have wet soil or sediment beneath them that could liquefy during earthquakes. When this happens, even a very small slope can cause the ground to slide. Some parts of major cities (including Seattle, Tacoma, and Olympia) have been built on land that was ‘reclaimed’ from soft and wet tidal ocean areas. Areas like these are also susceptible to liquefaction. 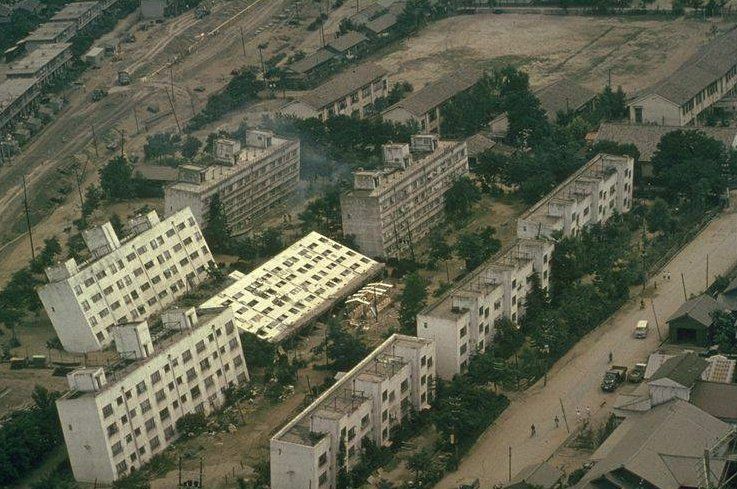 Liquefaction can be a big problem. The buildings in this photo were built on soft materials that liquefied during the 1964 Niigata earthquake in Japan. The buildings sank when ground shaking weakened the underlying sediments. Photo from https://buildingfailures.files.wordpress.com/2014/02/tiltedbuilding.jpg. Do you live or work near an area that could have liquefaction? Check out the liquefaction susceptibility and NEHRP site class maps on the Geologic Hazard Maps page. Landslide at Salmon Beach was triggered by the 1949 Tacoma earthquake and caused a tsunami. Photo courtesy of National Center for Tsunami Research, NOAA. Landslides can be caused by strong ground shaking during an earthquake. This kind of landslide is called an earthquake-triggered landslides. When the ground shakes during an earthquake, it moves up and down, acting like ‘additional’ gravity. This can cause landslides to occur where they wouldn’t normally happen. It can also make landslides that are much bigger than expected. In Washington, the risk from earthquake-induced landslides is large. Many landslide-prone areas of Washington are also located near active faults. The 1949 earthquake near Tacoma triggered a landslide near the Tacoma Narrows that caused a local tsunami. Even places that are far from active faults are still at risk during a large Cascadia subduction zone earthquake. Learn about at-risk areas and become prepared. This image shows the how the 1700 AD tsunami from the Pacific Northwest crossed the Pacific Ocean. Image from the Pacific Geoscience Center of the Natural Resources of Canada. Tsunamis and seiches are destructive waves which can be triggered by certain types of large earthquakes. When a fault with vertical movement ruptures the ocean floor, it lifts up part of the ocean. This uplift creates a very broad wave called a tsunami. The tsunami becomes taller as the ocean becomes shallow. For example, in the open ocean a tsunami may be less than a few feet tall. Close to shore, this same wave could reach heights of 30–100 feet or more. Tsunami waves can travel over 500 miles per hour in the open ocean. This means that a tsunami made by an earthquake on the Cascadia subduction zone will start to impact the Washington coast in less than 15 minutes. Because they can travel great distances, tsunamis generated from earthquakes across the ocean can still cause damage. The Pacific Tsunami Warning Center is located in Hawaii and is responsible for issuing alerts to all the countries that border the Pacific Ocean. Tsunamis triggered by earthquakes usually require at least a M7 event. Because they need large earthquakes that move the ocean floor, tsunamis are most commonly made by subduction zone faults like those found off the coasts of the Pacific Northwest, Japan, and Chile. The last large earthquake on the Cascadia subduction zone was in 1700. It devastated the coast of the Pacific Northwest and sent an ‘orphan’ tsunami to Japan. Tsunamis and seiches can also be triggered by large slides, both on land and underwater. The last earthquake on the Seattle fault (about AD 950) triggered a landslide and seiche in Lake Washington. The 1964 M9.2 Alaska earthquake created a large tsunami from the fault rupture, and many smaller tsunamis from on-land and underwater landslides. Although both seiches and tsunamis can be large and destructive, they are created differently. A seiche is a large ‘standing wave’ caused by the resonance of a particular period of wave energy. In effect, the wave energy is ‘trapped’ by the edges of the body of water. Since about 1870 there have been about 15 large earthquakes (greater than M5) in the state. Before modern record keeping, Native Americans lived in the Pacific Northwest for thousands of years. Story telling is an important part of the Native tradition and is how their history is passed down to the next generation. Within this rich oral history there are many references to events like earthquakes and tsunamis. Scientists have used the stories from tribes along the entire Pacific Northwest coast to learn that the last large earthquake on the Cascadia subduction zone was about AD 1700. This date was confirmed by records in Japan of an ‘orphan’ tsunami and by many lines of geologic evidence. Stories from tribes near Seattle have also helped us to learn that the last earthquake on the Seattle fault was about AD 900–950. This earthquake caused parts of Restoration Point near on Bainbridge Island to be lifted 35 feet straight up. This movement created a tsunami in Puget Sound and triggered a large landslide into Lake Washington. When the landslide hit the water it may have created a tsunami. Radiocarbon dating and other paleoseismic methods have also confirmed this date. This interactive graphic shows major earthquakes in the Pacific Northwest. Hovering over the earthquakes will show more information about the event. Graphic from IRIS.